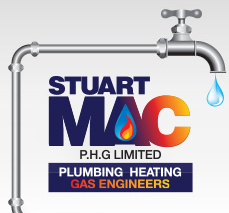 STUART MAC PHG provide a wide range of Heating and design services from repairing faulty ball valves to design and installation of new central heating systems. When it comes to making the decision to have your heating system upgraded or replaced there are many factors to be considered, our fully qualified staff are able to repair replace recommend and design systems to meet your specifications. Give us a call today to discuss your needs. STUART MAC PHG provide heating design services we will visit your home discuss your heating and water requirements future possible needs then calculate the correct size of boiler, radiators and controls taking into account the type of house you have heat loss, the number of bathrooms / en suits to ensure that you are not over sizing therefore overpaying for your new system. There is a charge for this service, if you choose to upgrade your system with us then we will refund this in your final bill. We can recommend and or supply and install your new system or simply install the choice is yours. As of April 2005 all new gas boilers must be over 90% energy efficient. If you own an old G-rated boiler with a seasonal efficiency of less than 70%, your home will benefit from using a new gas boiler which is rated A for energy efficiency. This is because a G-rated boiler only efficiently uses around 70% or less of the energy it produces for the purpose of heating your home or hot water, with the remaining 30% being lost through the flue. Many new high efficiency boilers have well over 90% efficiency, which means less wastage and more money saved on heating bills. Stuart Mac PHG are Premier installers of the Ideal range of boilers as such all of our engineers are approved trained installers for Ideal, whilst we will always recommend Ideal appliances we will obviously fit other makes if our customers prefer. 'Combi' boilers deliver hot water on demand and are very economical to run because they don’t use an external hot water tank. The fact they don’t take up much space and you never have to wait for hot water makes them a popular choice, especially in households where it’s not possible to have a storage tankIs this my ideal boiler?· You live in a small house or flat without many bathrooms, or want more space.· You want to convert your loft but currently have a water storage tank in it.· You want instant hot water in your home and drinkable water from every cold tap. A system (or pressurised sealed system) boiler uses a sealed hot water storage cylinder which is usually installed in an airing cupboard. There is no need for an expansion tank in the roof as the combination of boiler and cylinder allows you to run mains pressure hot water from more than one outlet at the same timeIs this my ideal boiler?· You live in a larger home with more than one bathroom.· Your household has hot water needs that can’t be met by a combi. A heat only (or open vent) boiler is usually connected to two tanks in the loft and a hot water cylinder in the airing cupboard. A small expansion tank supplies water to the boiler and radiators, and a larger cold water storage tank provides the cold water feed to a hot water cylinder.Is this my ideal boiler?· You already have a heat only boiler and want to replace it as inexpensively as possible.· You want to run hot water from different sources at the same time.· You have enough space in the loft to house storage tanks. For more information please give us a call to discuss. Please note we don’t install cheap boilers we install reliable efficient boilers. Is your overflow constantly leaking leaving pools of water on the paving, this can lead to further damage to you outside walls or paving or cause an icy patch for people to fall on. You may be suffering from whistling noises during windy periods. We can repair / replace this and prevent ongoing damage. Your cold water storage cistern maintains its water level by using a ball valve which over time needs maintaining and replacing to ensure that your cistern does not overflow or fill to the required levels causing constant annoying water filling / dripping noises and can be the cause of a dripping overflow. We can repair / replace this for you. Is your cistern doing its job properly does it comply with the Water regulations advisory scheme (WRAS)? Is it correctly insulated along with your pipes? This cistern provides you with potable drinking water so you need to ensure that it is correctly sealed and free from possible contamination! We can carry out improvements or replace your cistern to ensure that it is safe and suitable for you. Your hot water cylinder provides you with hot water that you have paid to have heated and then re heated ensuring that the cylinder is insulated, working efficiently and not leaking can save you money. Ensuring that your cylinder thermostat is correctly fitted and working can also help you save. We can repair / replace / insulate your cylinder / thermostat to ensure that you are not wasting hard eared cash. Unfortunately we currently are not able to work on these cylinders please keep checking the web site as this will change soon. Please ensure that the engineer you do call in is qualified to work on these systems. In hard water areas after prolonged use your thermostat will become less effective and eventually need replacing due to scale and deterioration. We can either recommend or supply a replacement thermostat and install. Your heating pump is a vital piece of equipment in your heating system which pumps the hot water around your system. These get clogged up with the sludge that develops in your pipes and eventually it will either become less efficient or need cleaning either by removing the pump or power flushing the system. Tell tale signs will be the noise your pump makes or the speed at which your radiators become hot. We can service or replace your pump for you. Please note if you have a combi boiler then this pump will probably be built into your boiler. What are my heating and hot water needs? There are several types of heating boilers such as back boilers which are fitted at the back of gas fires and stoves. These units are becoming rare and have made way for more modern designs. Some of the best boilers around are condensing gas boilers these units are highly energy efficient and have a condensation drain as well as a flue. They are installed with a fully pumped system and are perfect for the more environmentally conscious homeowner. The most popular boilers are combi gas boilers. They provide hot water and heating but not at the same time. They are relatively cheap gas boilers with most manufacturers offering very affordable high quality models. Combi gas boilers are considered the best boilers for small houses and flats. If you have multiple bathrooms or en-suites then the combi boiler may not be the best choice for you! We can provide traditional A rated condensing boilers that will provide heating to your radiators and heat your hot water cylinder to provide hot water. In this case a system boiler will meet your needs. For the average household with only one bathroom the best boilers are combi gas boilers. They are often small, compact, highly efficient and offer immediate hot water. Combi gas boilers heat water without the need of a tank, so as well as the space saving benefits you are saving money on heating bills because you don’t have to repeatedly heat a huge tank. What if I want to have security of water in my home if there is a main leak? If you want the safety of always have in stored supply of water in your home then a traditional condensing boiler with cylinder and cold water storage tank is for you.